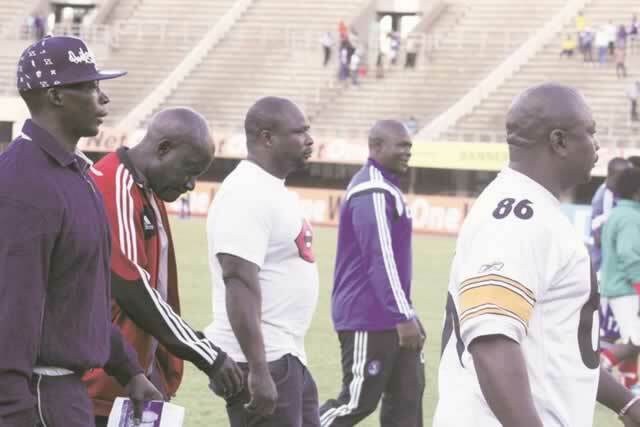 DYNAMOS coach David "Yogi" Mandigora is worried by the Glamour Boys' poor form at home after his side had to fight hard in the dying moments to salvage a point against Triangle in a Castle Lager Premiership soccer match at the National Sports Stadium yesterday. Mandigora, who has been a target of a section of the club's supporters, was yesterday escorted to and from the pitch by bouncers following last week's incident at Rufaro when a group of supporters opposed to the coach called for his sacking when Dembare played a goalless home draw with Tsholotsho. It looked things could get nasty for him again yesterday after the supporters at the "Vietnam" bay went into overdrive during the second half chanting damning songs, specially composed for the veteran coach as Dembare were trailing 1-0. The supporters were not happy as their side always played second fiddle to the visitors who looked more enterprising. Despite the campaign against Mandigora, Dembare are still looking good on the log standings.